Christmas holiday (vacation) time, so how to dress slouchy but not slobby ? For a similar classic cardigan, tees and leggings, see Pamela’s Patterns, or Nancy Zieman’s wardrobe patterns for knits McCall’s 7548 and McCall’s 7331. Perhaps made in a larger size to get the extra ease of loungewear. For a little more ‘artistic’, there are no leggings but a tee and more varied layers from Sewing Workshop e-pattern downloads. For ‘athleisure’ style sweatshirts and joggers there’s a wardrobe of sweats from Jalie. (Add an open ended zip for a jacket, and make these look more everydaywear by omitting the bands at wrists, hips, ankles). But this capsule plan would not work for me. 1. I don’t wear knits – they make it obvious I have no lumps and bumps where there should be, and many lumps and bumps where there shouldn’t be. 3. I prefer more interesting style elements, rather than adding interest with prints or accessories. With so many reasons that capsule is not right for me, it’s fortunate there are many other ways of dressing ultra-casual. My preference for style that’s one-up from pjs would be clothes made in flannel or fleece. Here are a couple of easy ideas. 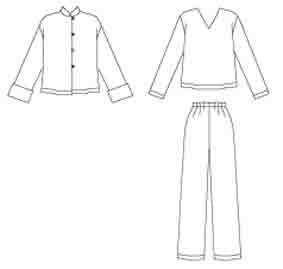 Butterick 6273, a sleepwear pattern made in soft but daywear fabrics. Even easier : the 100 Acts of Sewing pattern group in my 2018 SWAP plan. My slouching-around outfits often include a vest. So make sleeveless versions of those ‘jackets’, perhaps in pre-quilted fabric. While writing this I’m wearing a padded vest, a cowl necked fleece top with blouse under, and flannel pj pants (in a Christmas print 😀 ). Change the flannel pants for slim cords to go outside, it’s not quite freezing here. The Butterick and 100 Acts patterns are two easy choices. There are many other ultra-casual patterns with more interest. StyleARC have some good layer-top-pants pattern bundles for outfits with a slouchy look. I wrote several posts some years ago which expand the possibilities for meeting this style challenge, and I find I haven’t changed my ideas. 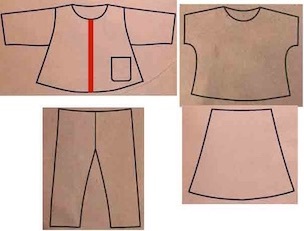 Some of the patterns in these posts are no longer available, but a surprising number of these easy sew – easy wear styles are still in print. Casual chic festive wear – tops, pants – copy Eileen Fisher by using simple shapes made in high quality fabrics. This entry was posted on December 18, 2017 at 11:24 am and is filed under specific capsules. You can subscribe via RSS 2.0 feed to this post's comments. Both comments and pings are currently closed. Love those pattern ideas. I’m a slouch dresser too (elastic waist loose pants, relaxed tunics and jackets). If I can get away with it, that’s my normal look, Happy Holidays!